It was another fun filled day at Cambourne at its finest with people of all cultures and backgrounds coming to enjoy a day out together at the second Cambourne Eid Fair on Sunday, 17th June, 2018 organised by Cam Harmony (www.CamHarmony.org) with the support of Cambourne Parish Council. Eid ul-Fitr is an important religious festival celebrated by Muslims worldwide that marks the end of the fasting month of Ramadan with the sight of the new moon and greet each other by saying Eid Mubarak, which means blessed Eid. 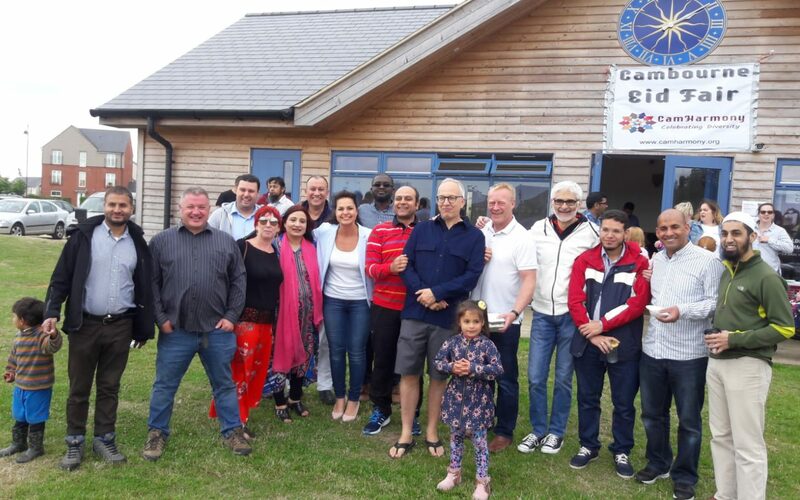 The Fair was a success with wider interfaith community from Cambourne, and surrounding areas along with national political figures attending the event. South Cambridgeshire MP Heidi Allen who attended the fair with her husband Phil said “The sun might not be out but the food is really warm and the hospitality is very warm, fantastic celebrations, very lucky to have been invited, Eid Mubarak, if you couldn’t come this year you must come next year”. Cambridgeshire County Councillor Mark Howell was very cheerful enjoying the feel of festivities said “It is really fantastic bringing people together, respect each other, having fantastic times together this is what Cambourne is all about”. The vibrant colours, smells and sounds, and the exhilarating thrill describes the Cambourne Eid Fair 2018 which had attractions for all age groups. It was fabulous to see little ones giggling and enjoying Bouncy Castle and getting thrilled by their beautiful Henna patterns and lovely face art. Food from around the globe including Biryani, Grilled food, Kebabs, Shawarma, samosas, cakes and Turkish food gave the multicultural feel. Coffee stall was over crowded as the people wanted to fight the cold winds with the hot coffee sips. Cam Harmony team would like to thank everyone who were involved in any capacity for their active participation. Special thanks to Cambourne Cricket Association and Cambourne Parish Council for their valuable support. Special thanks to Dr. Asif Jah, Nousheen Asif, Arshad Khalid, Atika Firasat, Dr. Sujit Bhattacharya, Dr. Shrobona Bhattachartya, Shabana Kareem, Rubeena Ameen, Samaira Hussain, Shakeera Jabeen, Aamina Sami, Tasneem Mohtashim, Nishat Azim, Sana Saif, Aashna Khan, Muhammed Saif, Syed Kareem, Shahid Hussain, Luqmaan Hakeem, Aslam Awan, Nuruddeen, Ameen Sherwani, Azim Ahmed Khan, Nishat Akhter, Syed Mohtashim, Shuja Andrabi, Ismail Sherwani, Sheik Hameed, Azim Sherwani, Faheem, Anoush Shah, Alwaaz (Ali) Khan and all others for their valuable contributions.